On this day in history, December 22, 1775, Esek Hopkins is appointed Commander-in-Chief of the Continental Navy. The Continental Congress had begun the process of establishing a Navy in October of 1776 by passing resolutions to purchase and arm four ships. Soon more ships were purchased and construction began on thirteen more. Esek Hopkins was a celebrated merchant captain from Rhode Island who had sailed to nearly every part of the globe prior to the war. He was the brother of Declaration of Independence signer and Rhode Island Governor, Stephen Hopkins, and was very well connected politically. With the outbreak of the war, Hopkins was appointed Brigadier General over Rhode Island's militia. His political connections aided in his receiving the appointment as Commander-in-Chief of the Navy, giving him equal rank with George Washington. 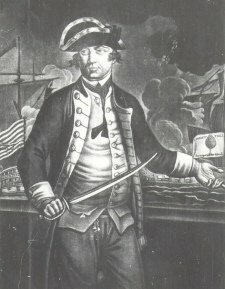 Hopkins though, would never receive the recognition or fame of his counterpart George Washington, mostly due to one bad decision early on in his career as Admiral. In January, 1776, Hopkins assembled eight ships and sailed for the Chesapeake Bay at Congress' orders, aided by Captain Dudley Saltonstall and First Lieutenant, John Paul Jones. Their mission was to "take or destroy all the naval force of our enemies that you may find there." After arriving, however, Hopkins determined that the British fleet was too powerful for his small flotilla, so he scrubbed the mission and made other plans. Congress had authorized him to go on to harass British ships in North and South Carolina or "to follow such courses as your best Judgment shall suggest to you... to distress the Enemy by all means in your power." Hopkins' decision? To go all the way to the Bahamas! Capturing the gunpowder and weapons store at the poorly defended port of Nassau was a goal of the Continental Congress and Hopkins apparently decided it would be better for public relations if the new Continental Navy captured a large supply of enemy weapons, instead of going into a battle with enemy ships that they may or may not win. Upon reaching Nassau, three-fourths of the gunpowder was spirited away by the British in the night on a fast ship, but the remaining gunpowder, numerous cannons and various government officials were captured, including the Royal Governor, Montfort Browne. In April, on their return voyage, the fleet captured two British ships near Long Island, but was outmaneuvered by the HMS Glasgow, which damaged one ship badly, killed or wounded eleven sailors and escaped capture by Hopkins' much larger fleet. Hopkins was praised at first for capturing the goods at Nassau, but questions and accusations arose about his character, his failing to capture the Glasgow and especially about his decision to go to Nassau. Congress formally censured him in June, 1776, for not following his orders in Virginia and the Carolinas. 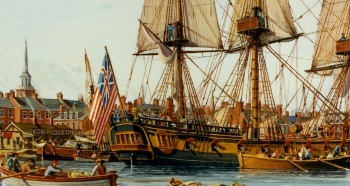 Hopkins then took his fleet to Newport, Rhode Island, which was blockaded and occupied by the British in December, trapping his fleet in Narragansett Bay. Congress relieved him of his command in the Navy for the loss of Newport in March, 1777 and dismissed him permanently on January 2, 1778. In spite of his disfavor in Congress, Esek Hopkins was still a celebrated figure in Rhode Island. He was elected to the Rhode Island Assembly repeatedly from 1777 to 1786 and served as a trustee of the College of Rhode Island (now Brown University) from 1782 to 1802. Learn about Hopkins' official standard as Commander of the Navy, the Gadsden Flag, here.